The good news is we got a lot of apples on the tree. The bad news is we got a lot of apples on the tree. 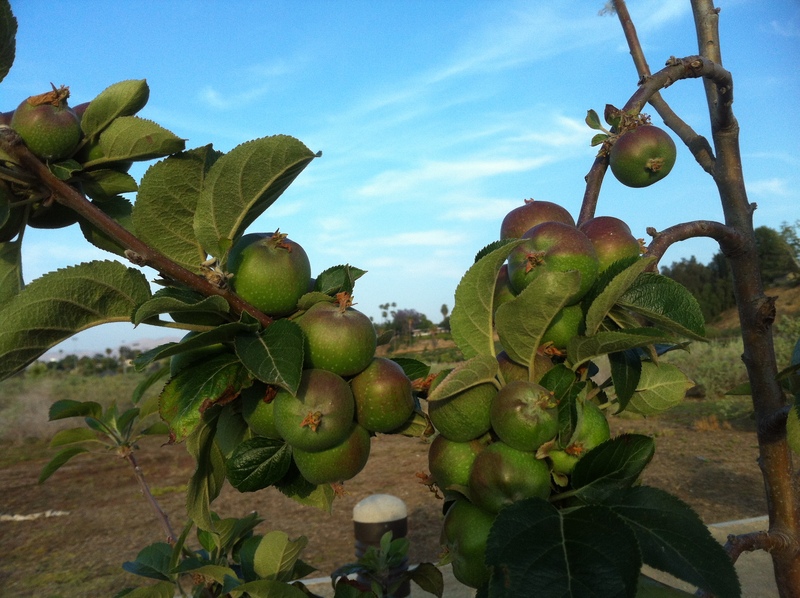 About a dozen varieties are doing this right now, with big clusters of apples like grapes weighing down branches. This is not good, as it will result in tiny apples, broken branches, and bi-annual bearing. The apples must be thinned to one per cluster, and at this point it must be done by hand. It’s a lot of work for what you get out of it, but part of being an apple grower. By the way, our winter was almost tropical, but we still got a heavy fruit set on the apples, even the high-chill varieties. I’m not sure why some years are heavy and some are light, but we still have a much more reliable yearly crop than up in the mountains, which gets hit with late frosts and dehydrating winds. This entry was posted on Sunday, May 31st, 2015 at 2:36 pm and is filed under Uncategorized. You can feed this entry. You can leave a response, or trackback from your own site.